Between 9000 and 4000 BCE, northern Africa and the Sahara were grass and woodland with an abundance of rainfall, rivers, lakes, fish and other aquatic life. Anthropologists speculate that from North Africa's Mediterranean coast, people migrated into the Sahara and that people migrated into the Sahara from the south. In the Sahara, communities raised sheep and goats, as people did along the Mediterranean coast. And communities of people fished in the lakes and rivers of the region, using intricately made bone harpoons and fishing hooks, some using nets with weights and other tools for harvesting aquatic creatures. Living a settled life, people began using pottery and growing food, using stone and wooden tools. To the east, along the upper Nile, including what was to be Nubia, people by 6000 BCE were growing sorghum and millet and a wheat believed to be of African origin. And by 4000 BCE, people in the middle of the Sahara region were raising cattle. Then around 3500 BCE the climate of North Africa began to dry, perhaps in part because of overgrazing – wetness needing vegetation as well as vegetation needing water. The Sahara started to change from grass and woodland to desert. Anthropologists speculate that some people fled the drying to the northern Nile River, taking with them their cultivation of wheat, barley, flax, various vegetables and their goats and sheep. And perhaps some people in western Sahara retreated southward to a wetter climate, taking with them their pigs, sheep, goats, cattle and knowledge of farming. In the Ethiopian highlands, herding and farming appeared, people there growing a cereal crop called tef and starchy stalks called enset. 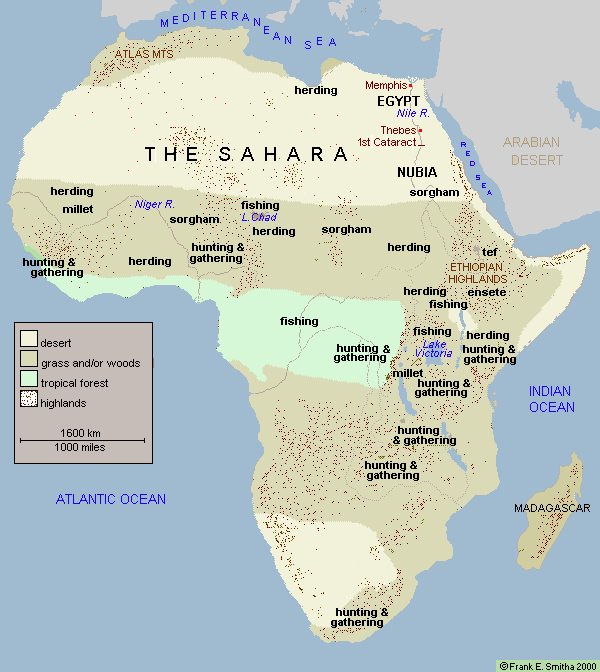 Remaining in the Sahara region were sparse populations of dark skinned people and also a people called Berbers, the Berbers occupying territory near the Mediterranean Sea. Those who had migrated to the northern Nile were related to the Berbers, or at least the languages of the two people were related – a language that has been classified as Afro-Asian. And scholars speculate that the Afro-Asian dialect had origins with people who had come to Africa from the eastern side of the Red Sea. 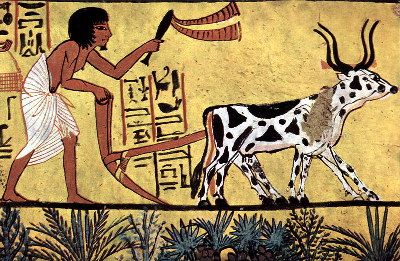 Meanwhile, in Africa south of the desert region many had begun small-scale farming and raising cattle. Those living in the continent's equatorial forests continued to rely almost exclusively on their hunting and gathering, which provided them with all they needed. It would be want and deprivation elsewhere that would mother new ways of doing things. People in the equatorial forests saw no reason to hack clearings to grow food that was already sufficient for their few numbers. South of the Sahara, the raising of cattle was at first limited to regions without the blood sucking tsetse fly, which could spread disease fatal to both cattle and people. It took many generations for people to build immunities to local diseases, which kept migrant communities from growing in the moist valleys and thickly wooded regions where the tsetse fly thrived. In some other parts of Africa where inadequate rain or other conditions discouraged farming, people continued to gather food that grew wild. Using exquisitely hand-crafted spears, bows and arrows, animal snares and poisons, they hunted small game. And with food supply limited, the populations of these various areas remained sparse, unlike what was developing along the northern Nile. By 1000 BCE, people in western Africa would be clearing portions of tropical forest with stone axes and planting yams, harvesting fruits and palm nuts and keeping goats. And east of central Africa's equatorial rain forest cattle raising was being extended, with cattle raising favored in the drier areas free of the tsetse fly. Peoples that herded more than they farmed were neighbors to those that farmed more than they herded, each side believing that their way of life was superior to the other.